In the grand tradition of the Auburn Flying Suplex shirts of Thailand, here are the Auburn-esque shirts Frank Crnko’s brother-in-law Geoff spotted for sale in Jerusalem, not at a hip vintage boutique a la Copenhagen, but at a flea market. We’re calling on our learned readers to translate the Hebrew. UPDATE: Well, according to our learned readers (Kenny and @auburnjosh) it just says “Auburn University.” We had hoped for something a little more esoteric, some cryptic prophecy about a Blessed Individual, maybe. Related: Allah In: Australia has a Muslim women’s football team called the Auburn Tigers. * Best Auburn majorette name ever? Bought two of these in Jerusalem a couple of years ago. Also bought a ring that says “War Eagle” in Hebrew! 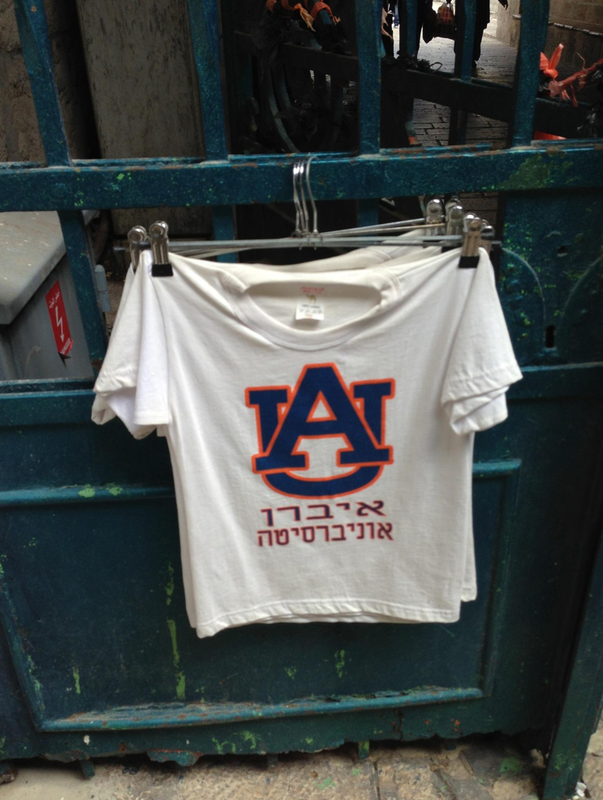 It just says “Auburn University” transliterated into Hebrew. Well, back in middle Georgia where I’m from i’m pretty sure that really translates into: The Promised Land!